this article has a graph at the end which i’ve always wanted to see. 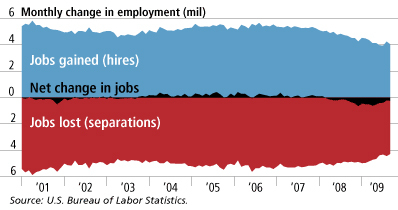 it shows, over the course of several years, # of jobs created, # of firings, and the net (in black between the two). it’s actually somewhat reassuring that there’s so many jobs, and that the black line is so small relative to the # of new jobs. but if you integrate the black area, it does ramp up quickly. another interesting aspect of this graph is that it seems to not be subject to what i consider a flaw in the regular bls statistics. the bls only counts people who’ve been jobless for up to 6 months, so the true number of jobless is much higher than the official figure, especially in a recession. however this article only considers # of hires versus # of fires, and so whether someone’s been jobless for 6 months etc doesn’t enter the picture. the total black area, as far as i can tell, should equal the total number of unemployed over the course of the recession.